Got 'em? Flaunt 'em in our classic lightweight crewneck big and tall muscle shirt with crewneck and no sleeves. Sleeveless with ribbed armholes Double-stitched seams for longer wear Fabric: Cotton. Care: Machine wash. Origin: Imported. 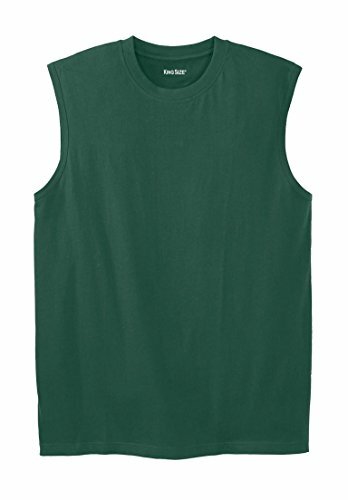 Big and Tall Mens T-Shirts - Lightweight Cotton Muscle Shirt. Big: XL - 9XL; length - about 33" Tall: L - 7XL; length - about 35" Read more: Working out? Perhaps we can interest you in a big and tall muscle shirt. Designed to show off your guns and keep you cool with a lightweight cotton knit, it's ideal for working out or just chilling on the beach. Wear it with active pants and aviator sunglasses. Reasons to Buy: Customers say this is a comfortable, lightweight option that's also made of durable, high-quality material. If you have any questions about this product by KingSize, contact us by completing and submitting the form below. If you are looking for a specif part number, please include it with your message.